The Project Deployment Model introduced in SSIS 2012, which was explained in the first part of this series, speeds up the deployment of database projects in which there may be hundreds of SSIS packages per project. 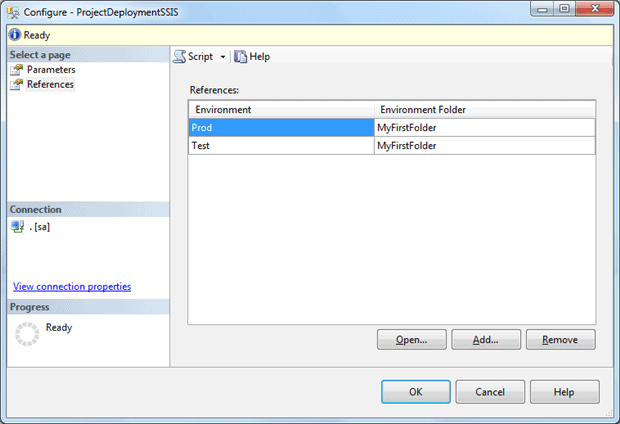 Not only that, but deployments can be configured differently for each environments such as test and staging, and there are now ways of monitoring the status and performance of packages and of versioning the SSIS Catalog. In my first article on Project Deployment in SSIS 2012 ‘Setup, Project Creation and Deployment’, I described the basics of the project deployment model for SSIS. 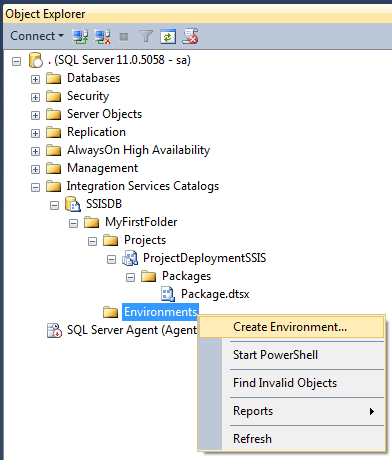 I then showed how to deploy a project to a SQL Server instance. This article aims to go into more detail about the way of configuring the deployed projects to fit different needs and different environments. 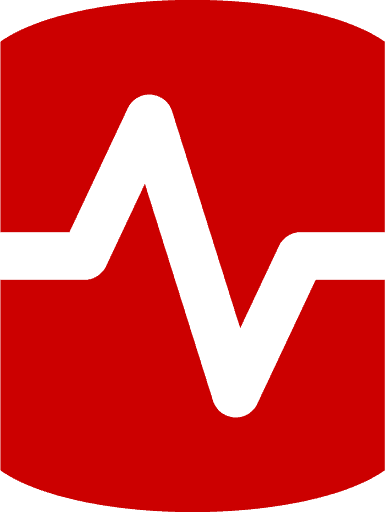 It will then go on to describe the ways of monitoring and versioning the SSIS Catalog. 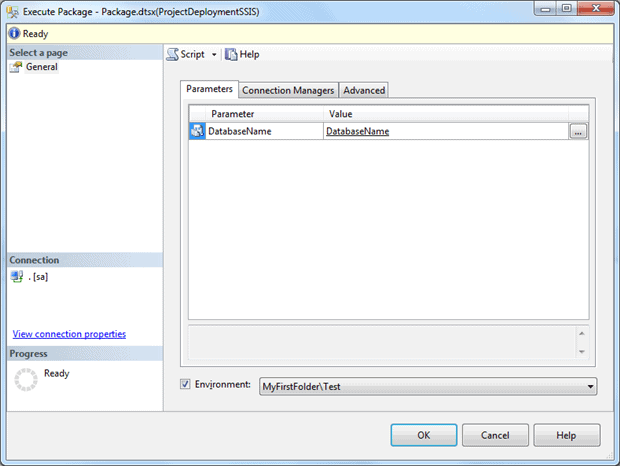 In the previous article, we created a project with an SSIS package. 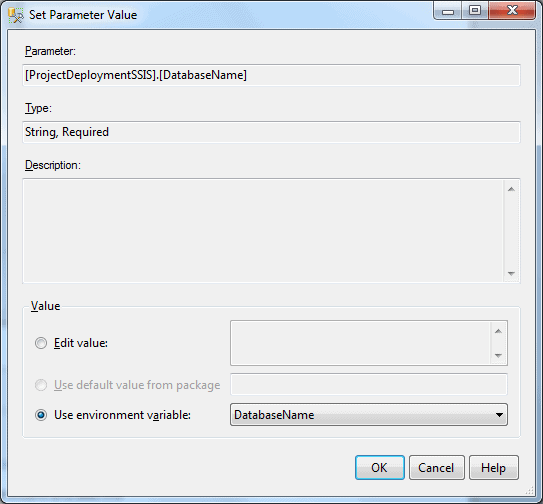 This project had a Project parameter called DatabaseName. The idea behind it was to be able to easily manage the different names of the databases, based on environment (let’s suppose that the database in the TEST environment is called ProjectDeployment_Test and the one in the PROD environment is called ProjectDeployment_Prod). To achieve our goal in this case, the Project Deployment model provides us with the means of creating Environments – which is a collection of specific settings that map to the project variables. Now we must create a variable in each environment that has the same name as our Project Variable. 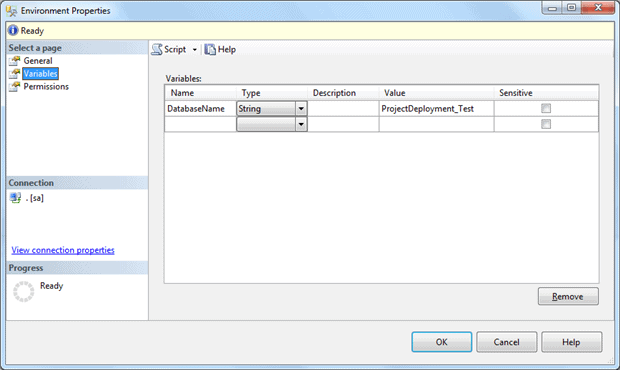 We double-click each Environment and, in the ‘Variables‘ tab, we enter the Variable name and the value for it. Keep in mind that the Variable name is the same, but the value for it will differ, depending on the environment. 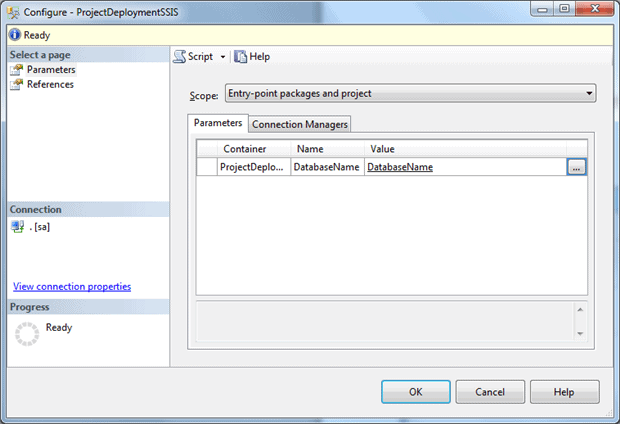 Now that we have set up the Environments and mapped them to the project, it is time to execute the SSIS package. 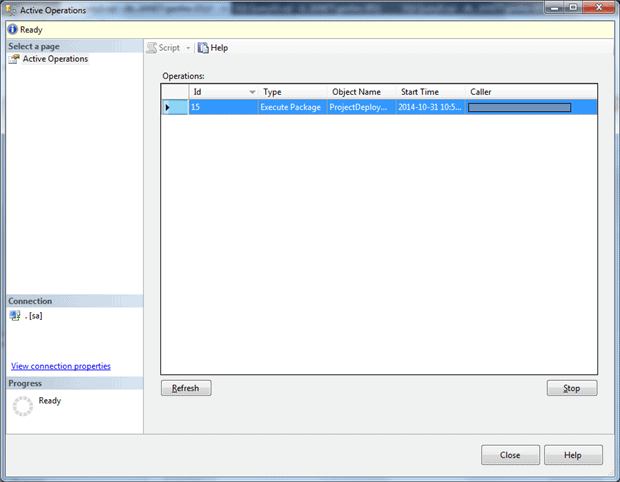 Right-click on the SSIS package and click ‘Execute‘. Select the appropriate environment and click ‘OK‘. This execution is just a single test execution. 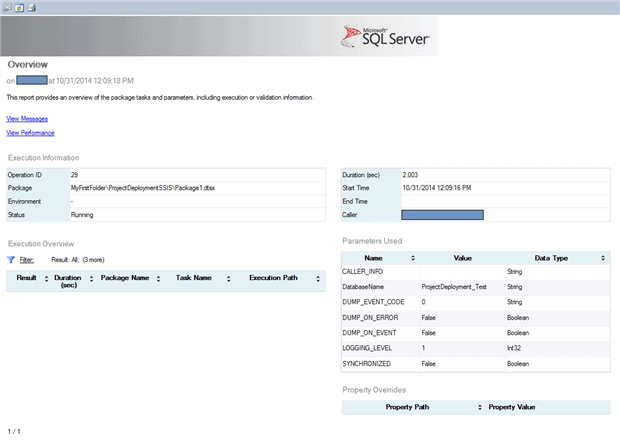 However, the dialog and configuration is very similar when we schedule SSIS packages via the SQL Server Agent. In this case, when we have multiple environments configured on the same server, we have to make sure that every time we schedule a package for execution, we have configured the right Environment. I.e. in each SQL Server Agent job we need to make sure that the configuration is correct according to the destination (Test or Prod). 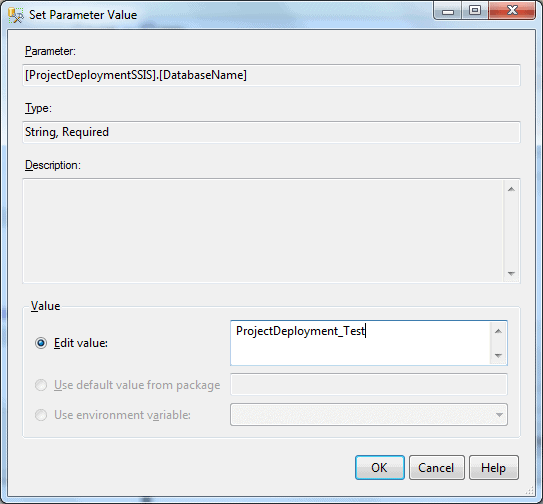 When we make changes to our BIDS project and when we re-deploy, we do not need to worry about any configurations – the SSIS packages in the project are deployed, but the Environments and the configurations are kept as-is (unless we change the names of the project variables). 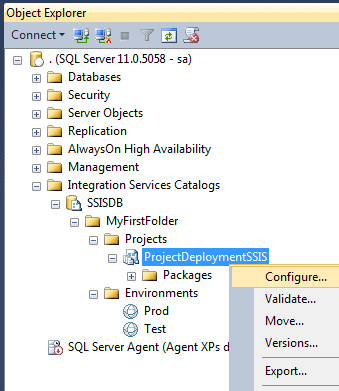 If the SSIS projects are deployed to more than one server, the configuration is a bit different. Let’s say we have a server called Test and a server called Prod, and we have to deploy the same project to both environments and configure it accordingly. We could, of course, use the same technique as above, where we deploy our project to each server, and then set up one Environment in each server and point the project variable to it. When we deploy next time, the settings will remain the same as we have configured them in every server, even though in our project the value for the project variable is different. 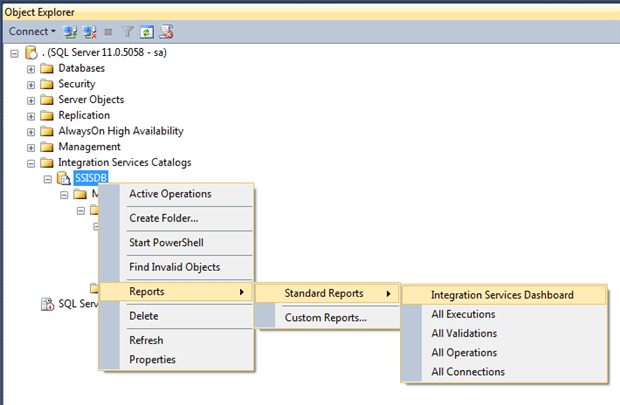 If we click ‘Yes‘, we are automatically taken to the SSMS Report which shows the execution status of the current package. 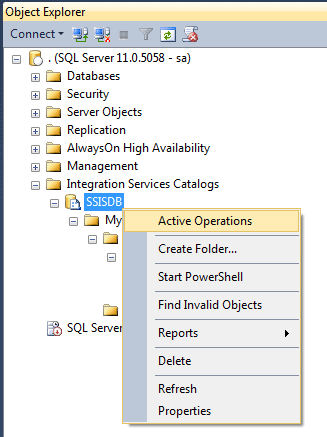 If we wanted to see what SSIS packages are currently executing on our instance, we would right-click on the SSISDB catalog and select ‘Active Operations‘. Unfortunately we do not have the option to click on the currently executing package and go directly to the execution statistics report from this tab. In order for us to see the package execution statistics and the current execution status, we have to navigate to the reports. One way to do this is to right-click on the SSISDB catalog and select the ‘Integration Services Dashboard‘ report. As we can immediately notice, there is a problem with our package execution. In this case, the failure is due to a validation error in my project. I have forgotten to specify the connection for one of my task components. This is a great learning opportunity: keep in mind that, in the project deployment model, there may be validation errors and the project can still be deployed even with them. If this happens, the execution of all packages in the project will fail on the server, even though the error is in one of the packages. As I mentioned previously, there is no way to deploy only a single package; we have to deploy the entire project every time we make changes. This is why we have to be extra careful when we deploy with the project deployment. Now that we have our project working successfully and we can execute packages, we are concerned with the performance of our packages. 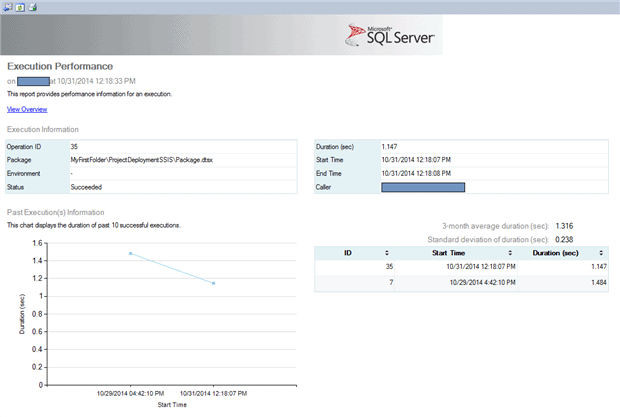 It is very easy to monitor the performance of an SSIS package on our server. All we have to do is click on the ‘View Performance‘ link in the Package Overview report. As we can see, there has been some improvement in run duration of the package. 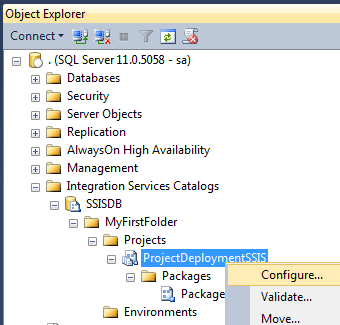 In this article I’ve described how to deploy SSIS projects with the project deployment model for use in different environments by means of configuration. I have then described the ways of monitoring and versioning of the SSIS Catalog. 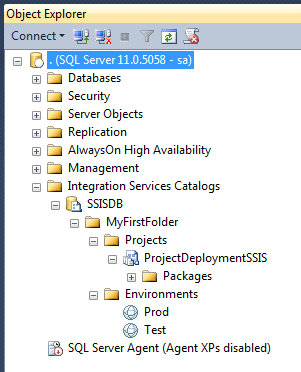 The management is almost effortless, since the metadata and SSIS project versions are stored in the SSISDB database within the SQL Server instance. Excellent article. 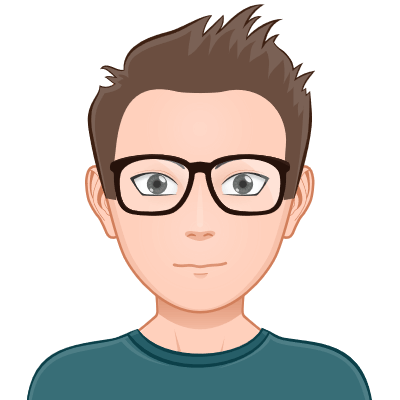 Do you have any thoughts on managing SSISDB with multiple availablity groups hosting different pairs of databases ? Good article. How I wish project parameters were available in SQL Server 2008 R2, would have saved a lot of time last week. Feodor, thank you very much for the article. Very educational. Could you confirm the fact that the "Project" and "Environment" variables need to have the same name? I understand that this might be a good practice, but it seems to me that you can create environment variables with any name since you can subsequently map them to your project variables. Thank you! Here is a simple question. Where I am working they use SQL Server 2012 and package configurations. There are a lot of jobs and they don’t have manpower or resources to convert them all at once. Can we run both project and package configurations on the server at the same time? I can’t find anything on the net that says it is OK to run both at the same time, I was told a few years ago it was one or the other but never confirmed that. I am trying to activate the ‘Create Catalog’ option using your script. The script is running without error but the option is still inactive. I ran the script on a new query window on both working database and master database. I am using an SQL Server Standard with SP3 instalation. We are working on migration from 2008R2 to SQL server 2016. From yesterday onwards , we trying to upgrade the SSIS packages and deploy on servers. Your article really helped me a lot. Thank you very much. This is excellent. Thank you so much for making these examples clear and simple. I posted something similar in the related “Creation and Deployment” post. Given all the additional functionality with modern versions of SQL Server, do you use and/or recommend any third party tools for SSIS development and deployment?